Sony is raising the price of its PS Plus subscription in territories including South Africa, Russia, Ukraine and Turkey. While there are some who still likely resent that you need it to play online with the PlayStation 4, we feel safe in saying that the service overall is actually a pretty danged good deal. You pay for your subscription and you get enough free games, discounts and goodies to pretty much immediately justify the initial down payment. 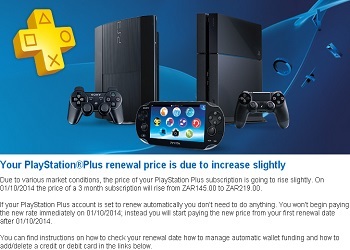 Sadly, it would now seem that for many Sony customers this good deal is about to get a bit worse. That, at least, is the impression many be left with following emerging reports that the company is substantially raising the service's prices in several countries and regions around the world. The first reports originated in South Africa where users reported that they'd received messages from Sony informing them that prices were "going to rise slightly" and that they'd be responsible for paying the new rate in January. While the increases were described as minor, it's worth noting that the hikes will be bumping the total price of a subscription up more than 50 percent. In South Africa, for instance, the new price will be R219 (roughly $19.43) a month instead of the current R145. Similar hikes have been reported in Russia, Ukraine and Turkey. Representatives from SCEA blamed the increases on "market conditions" and confirmed that no such changes are planned for North America. We've reached out to Sony to see if we can procure any further details.